Disasters can strike anywhere and at any time. The recent Japan quakes and the droughts in India are testimonials to this fact. Now, though we have a little control over the timing and occurrence of the disasters, all we can do is curtail the disaster’s impact and Disaster Management is aimed at achieving just that. DISASTER MANAGEMENT explains how to overcome and get cured from disasters like floods, droughts, cyclones, earthquakes, tsunami, landslides, bomb blast, fire, accidents, poisonous and chemical disasters. The term disaster owes its origin to the French word “Disaster” which is a combination of two words ‘des’ meaning bad and ‘aster’ meaning star. Thus the term refers to ‘Bad or Evil star’. A disaster can be defined as “A serious disruption in the functioning of the community or a society causing economic, social and environmental losses which are uncontrollable for long period of time. Water: You should have a three-day supply of water on hand, or about one gallon per day per person. If your water is not already treated with chlorine, add some household bleach to the bottles. It should be stored in a cool, dark place for no longer than six months. Food: Put aside at least three-days worth of food in your disaster kit that is non-perishable and don't need refrigeration. Also, choose foods that don't need heating. Avoid foods with a high salt content as they will make you thirsty. Foods that are recommended are: Candy, chocolate, tea, coffee Sugar, salt, pepper, Canned juice, milk, soup Canned fruits, meat, vegetables Peanut butter, jelly. Assemble a first aid kit: for your home and one for each car. A first aid kit should include 24 Sterile adhesive bandages in assorted sizes, 2-inch sterile gauze pads (4-6), 4-inch sterile gauze pads (4-6), Hypoallergenic adhesive tape, Triangular bandages (3), 2-inch sterile roller bandages (3 rolls), 3-inch sterile roller bandages (3 rolls), Scissors, Tweezers, Needle, Antiseptic’s, Thermometer, Tongue blades (2), Tube of petroleum jelly or other lubricant, Assorted sizes of safety pins, Cleansing agent/soap, Latex gloves (2 pair), Sunscreen, Non-prescription drugs pain killer, Antacid (for stomach upset). One should make sure that the disaster kit contains clothes that provide protection from cold and from heat. There should be at least one change of clothing per person, including footwear. Special items: include family documents such as birth certificates, passports, photo id, bank account numbers, credit card numbers, household inventory, cash and important things. 1. MAN-MADE- Man-Made disaster are specific events where a man made hazard has come to fruition. Fire safety refers to precautions that are taken to prevent the likelihood of a fire that may result in death, injury, or property damage. Three elements of fire are fuel, any combustible material-solid, liquid or gas, oxygen and heat. The last person in the room should not lock the door. Always use staircase to exit the building. In case of LPG, remember to walk briskly do not crawl. Call the ambulance, fire brigade and police. When a natural disaster occurs, we can't always rely on police or governments to provide help. Earthquake is a sudden shake of the earth, which lasts for a short time, within a very limited region. Most earthquakes last for less than a minute, but sometimes shock may last, for as long as 3 to 4 minutes. The place where an earthquake originates inside the earth is called the focus of the earthquake. 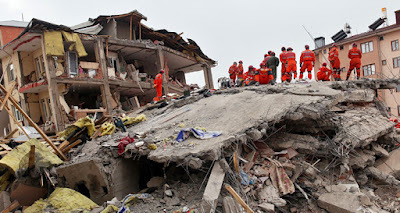 Most human lives in earthquakes are lost due to collapse of buildings. If you are caught indoors at the time of an earthquake, stay away from glass windows, doors, almirahs, mirrors, falling plaster, bricks or stones. Get under a table or a sturdy cot so that you are not hurt by falling objects. Do not rush towards the doors or staircase. They may be broken or jammed. If you are outdoors at the time of earthquake, If open space is available nearby, go there. Keep away from tall chimneys, buildings, balconies and other projections, Do not run through streets, hoardings or lamps may fall on you. A flood is an overflow of an expanse of water that submerges land. Flood is defined as a covering by water of land which is not normally covered by water. In the sense of "flowing water", the word may also be applied to the inflow of the tide. Flooding may result from the volume of water within a body of water, such as a river or lake, which overflows or breaks levees, with the result that some of the water escapes its usual boundaries. While the size of a lake or other body of water will vary with seasonal changes in precipitation and snow melt, it is not a significant flood unless such escapes of water endanger land areas used by man like a village, city or other inhabited area. One needs to be prepared at all times for any kind of disaster. As of April 2016 there have already been 9 earthquakes around the globe and 2 Tsunami warnings. I do hope that people who read this article on Disater preparedness are able to implement some bit and live a safer life.